Professional and amateur photographers worldwide were invited to enter the fifth International Landscape Photographer of the Year competition for a chance to share in the prize pool, including US$10,000 cash. 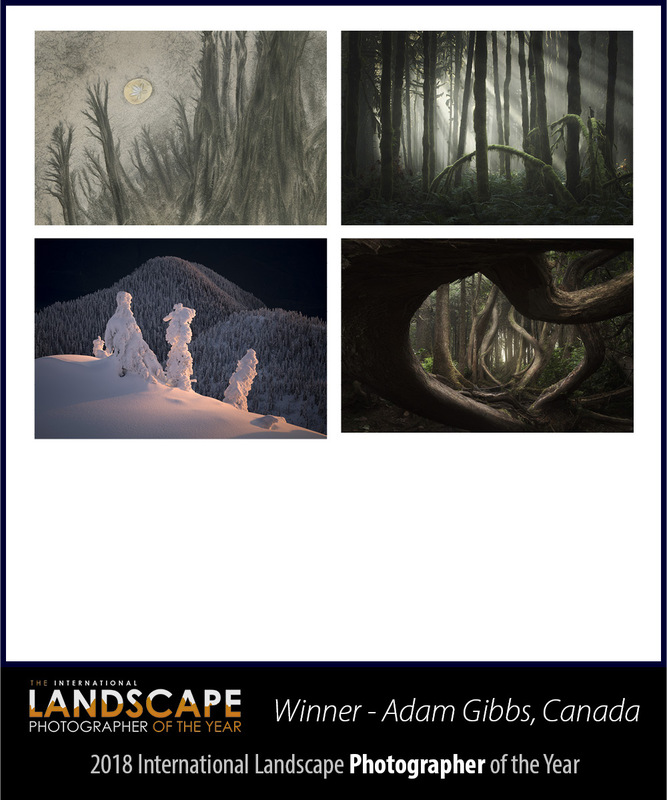 From nearly 3000 entries from 863 photographers, the winner of the fifth International Landscape Photographer of the Year (based on a folio submission of at least 4 images) is Adam Gibbs from Canada. What makes a great landscape photographer? Persistence? Experience? Luck? Passion? Looking at Adam Gibbs’ winning portfolio, we can see a diversity of views, an understanding of light and the expert use of framing and composition. From sandy aerials to icy mountain locations, Adam’s portfolio demonstrates a range of topics, an essential component when it comes to convincing our judges that you are the International Landscape Photographer of the Year. Adam Gibbs lives part-time between New Westminster, British Columbia and Parksville, Vancouver Island, Canada. Adam says he was originally inspired by a nature photography book written by John Shaw in the 1980s. “Since I'm still a bit old school from the film days, I tend to try and capture the majority of my images in a single frame. I don't have strong views on image manipulation, other than I find more joy in capturing great light and composition on site, rather than creating something that didn't exist when I took the photo. My love of nature and the outdoors is much stronger than my desire to make images, so for me, pictures taken at the moment have far more integrity and personal meaning than those made later in a computer. Adam is currently using a Nikon D850 along with 14-24mm, 16-35mm, 24-120mm and 70- 200mm lenses. “And I l love the Breakthrough Photography filters, especially the Dark X4 CPL filters that combine a 3 or 6 stop ND filter with a polariser into one filter. When we asked Adam if he had any secret locations worth investigating as a landscape photographer, he was quick to nominate one of his homes, Vancouver Island. “It is an exceptional place. The landscape is rugged, but not in your face and extremely challenging, especially the forests. I love it. However, other than the popular Canadian Rockies, the rest of British Columbia and Canada itself are highly underrated, in my opinion, as prime photo destinations for those seeking raw wilderness experiences. “And entering contests such as the International Landscape Photographer of the Year is an excellent way to gain recognition from your peers and the general public. It's also a great way to get your work out there in front of the world to see – and the chance of winning a major prize is always appealing! “I have entered many contests in the past. I tend to enter in waves. Some years I'll enter a few and other years none. Of course, not placing in a contest is disappointing, especially if you believe that your image is the best that you have ever taken. However, I don't take it personally because I know that judging in itself is a long and sometimes arduous process. The results are almost always contentious and, of course, subjective, but in the end, I am usually happy for the winners as they have gained the things that I enjoy about winning contests, recognition from their peers. 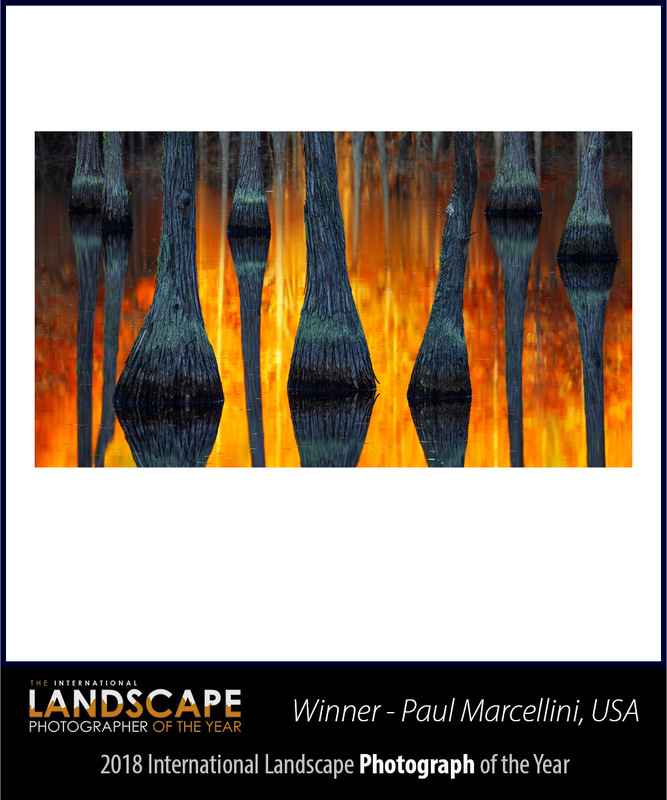 The winner of the fifth International Landscape Photograph of the Year (awarded for a single image) is Paul Marcellini from the USA. While a portfolio of winning images may be a little quieter individually, a single winning image must stand on its own with presence and impact. Paul Marcellini from the USA understands this and is the 2018 International Landscape Photographer of the Year. Paul is a full time landscape photographer who specialises in Florida scenery, with a focus on print sales. Paul says he enjoys using Canon’s 17mm and 24mm tilt-shift lenses on his Sony A753 camera, adding that the Canon 11-24mm ultra wide-angle zoom is also a staple in his camera bag. “I shoot raw and start working on my files in Adobe Camera Raw before moving into Photoshop. I use the tilt- shift lenses to make nearly seamless stitches and after putting together the panoramas, I typically do colour and contrast work to lead the eye to the centres of interest, but there’s not much more done after that. I always try to minimise the post-processing since large prints are the goal. Since so much of Paul’s work is achieved in-camera, he says light and composition are paramount for him. “While I love crazy storms, I am most proud of a well put-together composition. Capturing a crazy storm can take a lot of preparation, but many times it is a lot of luck and fast paced in my experience. Paul says he respects the aims of the International Landscape Photographer of the Year award and has always thought the winning images were of very high quality. Well, on this occasion, Paul’s image was picked – and we’re sure you can see why! Landscape photographers are a passionate lot! Some are passionate about discovering remote locations under exceptional light, while others are passionate about using their imagination to create landscapes of the mind. However, both schools of thought put their differences aside to engage in our annual International Landscape Photographer of the Year Awards. The International Landscape Photographer of the Year Awards 2018 presents 101 exceptional landscape photographs, selected by an experienced judging panel from nearly 3000 entries. Entrants and winners alike represent all corners of the globe in a wildly disparate display of remarkable and emotionally charged landscape photographs. While entrants’ main aim is to be one of the top 101 images of the year, the judges are also asked to do what is really an impossible task: to pick the best of the best. But is it the best photograph or the best photographer? For this reason, the Awards have two main prizes. The Photograph of the Year is for the best single landscape photograph, while to be named International Landscape PhotographER of the Year requires a set of four images, showing in addition to a spark of landscape brilliance, a degree of consistency and experience. Please enjoy the fruit of our fifth awards – and the best international landscape photographs of 2018. We believe where possible in maintaining a consistent judging panel from year to year. However, we also invite the previous year's winner to be a judge. 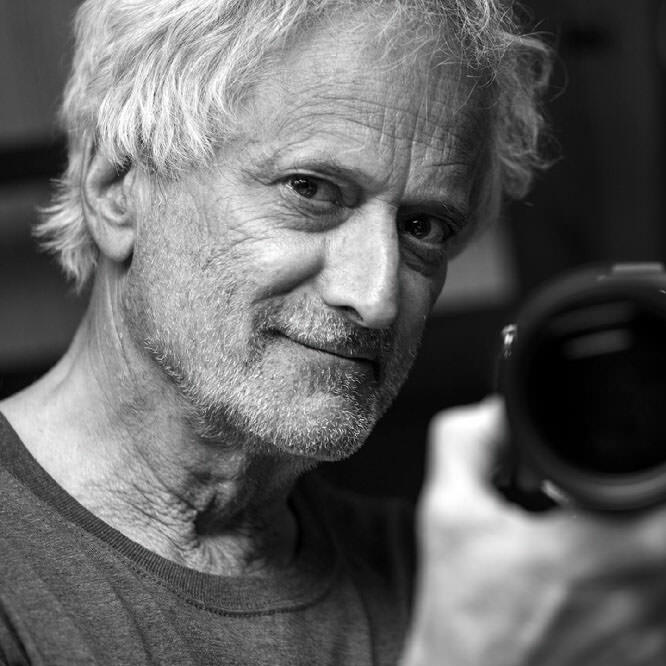 DAVID BURNETT (born Salt Lake City, Utah 1946) He learned photography at the Olympus High yearbook, and later shot pictures (mostly sports) at Colorado College (BA Poli Sci ‘68.) He began working as a freelancer for Time, and later Life magazine in the late 1960s spending two years covering the war in Vietnam. Following the demise of Life Magazine weekly, he joined the French photo agency Gamma and subsequently, in 1975 he co-founded Contact Press Images, in New York. His work for news magazines in Europe and the US has included politics, sports, and portraiture as well as the news. He has covered every Summer Olympic Games since 1984, including the 2018 Korea Winter Olympics, and photographed every American President since John F Kennedy. His awards include ‘Magazine Photographer of the Year’ from the Pictures of the Year Competition, the ‘World Press Photo of the Year’, and the Robert Capa Gold Medal from the Overseas Press Club. 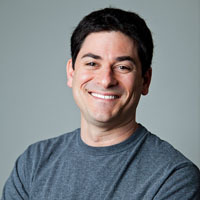 He has produced photographic essays for Time, Fortune, GEO, Paris-Match and ESPN Magazine. He served on the World Press Jury in 1997, 1999, and chaired the jury in 2011. He also taught the World Press “Joop Swart Master Class” in 2007. 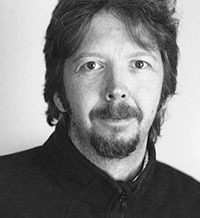 He is the author of two photographic books: “Soul Rebel - An Intimate Portrait of Bob Marley,” and “44 Days : Iran and the Remaking of the World,” picture taken during the 1979 Iranian Revolution. He calls New York home, but is at home anywhere there is a good story. Tim Parkin is On Landscape online photography magazine's editor and, along with Joe Cornish, co-founder. Originally a computer engineer with a PhD, he has worked extensively in publishing, the internet and the music industry, but today Tim is immersed in all aspects of the art and craft. While his background means he is completely comfortable with digital photography and post-production, he chooses to shoot a lot of his landscape work on film using large format cameras. "Our original goal for On Landscape was to create something dedicated to the people we both meet on a fairly regular basis. The amateurs who spend all of their spare time in the field, the semi-professionals trying to make a living from this misunderstood occupation and the full timers who have managed to build themselves a niche in a challenging business field. "At the end of the day my photography is about learning; learning to see, learning to take pictures, learning about other photographers. This process also becomes a conversation with other photographers (who tend to be a nice bunch mostly) and this engagement is satisfying in itself." Born and raised in the flat country off the Netherlands, Max visited the high mountains of Switzerland for the first time at the age of 5. Looking at topographical maps, making hiking routes and running in front of his parents and brother, it was immediately obvious that Max had a true and deep passion for mountains and landscapes. Many years passed by before Max would go back to the mountains for a hiking trip in the Swiss Alps. Even though Max ended up in the hospital after 3 days, he found his passion for the mountains again and returned many times to the European Alps. As big as his passion was for mountains, photography and other hobbies - such as motorsport and cycling – so small was his passion and motivation for the countless studies he followed. The travels he made during his study made him realise that his current path and direction were only motivated by the expectations of his surroundings. After missing a deadline for his study, Max decided to end his life as a student and stepped only weeks later onto a plane bound for the Himalayas of Nepal. 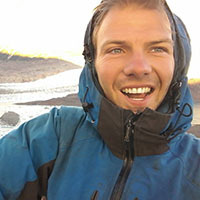 After almost losing his life in an airplane accident, and witnessing the major earthquake in April 2015, he continued traveling around the world to Chile, Argentina, Greenland, Sweden, Scotland, Norway and New Zealand. 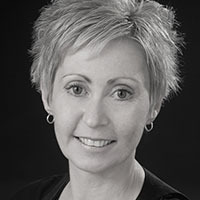 “I gradually became more serious as a real landscape photographer when I started sharing photos on the internet and became inspired by the work of others – and by ‘real’ landscape photographer, I mean using tripods, filters, bigger cameras and waiting for days at a spot to get the shot. Max was the winner of the 2017 International Landscape Photographer of the Year and as such has been invited to be on the 2018 judging panel. Max was also the winner of the 2018 International Landscape Photograph of the Year - winning both the major awards. Competitions are not perfect and with so many great landscape photographs (101 to be exact), being the overall winner, the top dog, the big prize winner, is going to need a little bit of luck. Nevertheless, that shouldn’t stop us from aspiring to be chosen by our panel of legendary and esteemed judges as the best of the best, the single most impressive landscape photograph of the past 12 months. Open to both amateurs and professionals! BUT HOW ABOUT FOUR OF THEM? It takes a practised eye and skill in post-production to consistently produce good work. And while in no way demeaning the achievement of capturing the overall International Landscape Photograph of the Year, let’s take a closer look at who is creating the best body of work. The International Landscape Photographer of the Year, whether an enthusiast or a professional entrant, recognises the skill and discipline to create a portfolio of images that stands above the work of your peers.